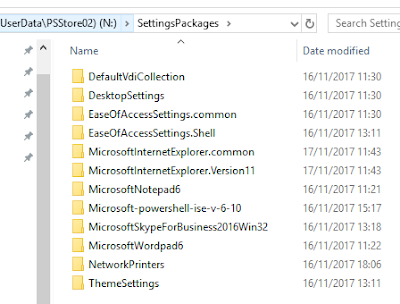 UE-V in Windows 10 is setup pretty quickly but the documentation for Group Policy and expected outcomes is all over the place. In order to help other IT Pro's navigate their UE-V implementation I have documented my configuration with observations. UEVAppMonitor.exe = Scheduled Task "Monitor Application Settings"
ApplySettingsTemplateCatalog.exe = Scheduled Task "Template Auto Update"
Microsoft.Uev.SyncController.exe = Scheduled Task "Sync Controller Application"
The UEV Templates folder is located within ProgramData folder and contains various sub-folders containing scripts, Templates and compiled Templates (depending on the Windows 10 branch). UEVAppMonitor.exe will monitor and Sync to the "SettingsStoragePath". 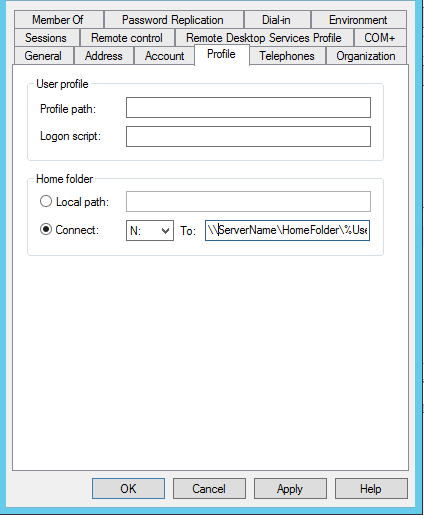 These Standard Templates can be registered individually or all at the same time via PowerShell. In 1709 there is the additional folder called "Scripts" containing the script RegisterInboxTemplates.ps1. See below for contents of script to register all Templates within the folder InboxTemplates. Within the latest Group Policy templates (Administrative Templates (.admx) for Windows 10 Fall Creators Update (1709) ) There is the option to Enable UE-V and Auto-Register InboxTemplates. This led me to believe the Register-UEVTemplates script was not necessary and Group Policy would automatically register these InboxTemplates. During testing this action was not occurring and I started to think there was a problem within my environment. However, this options appears to be only available if you exclusively run domain controllers 2012/R2 and above. See Documentation here. "Group Policy ADMX templates configure the synchronization settings for the UE-V service and enable the central management of common UE-V service configuration settings by using an existing Group Policy infrastructure. 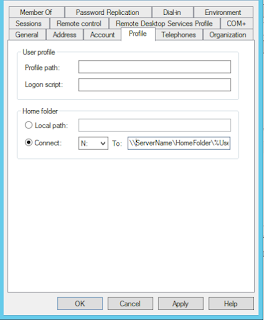 Windows Server 2012 and Windows Server 2012 R2"
If your environment is like mine with Domain Controller Functional Level 2008, there are several ways in which you can register these Templates automatically. An SCCM Baseline can be used to check for the compiled file/s and if non-compliant be resolved by remediation, i.e. Register-UevTemplate '\\SERVER\SHARE\UEV\Templates\*.xml'. Alternatively you can copy all the InboxTemplates (C:\ProgramData\Microsoft\UEV\InboxTemplates) over to the UNC Share "SettingsTemplateCatalogPath"; then within group policy you can specify the Template Catalog path and tick the box to "Replace the Default Microsoft Templates". This will copy all the InboxTemplates (and Custom Templates) over to the Computer and register within the "Templates" folder as originally intended. Once the UEV Service has started (Enable-UEV) the SettingsTemplateCatalogPath value will be evaluated every 30 minutes. New templates discovered are registered and compiled. Once the Template has been registered and compiled to the "Templates folder" will be read by the process UEVAppMonitor.exe and detect all defined configuration changes. These changes are then copied to the "SettingsStoragePath" as a central location. The copy occurs every time a users logs out of a computer or every 5 minutes by default. 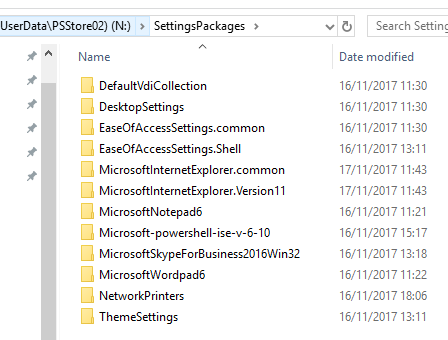 If the "SettingsStoragePath" is not defined in Group Policy or manually by PowerShell the UE-V agent will read your Active Directory Home Folder path and set as default. The value can be changed via PowerShell or defined specifically within Group Policy to another UNC share location i.e. \\ServerName\UEVData\%UserName%. We had an extra registry setting for UEV that could not be removed by the ADMX templates; this settings was possibly left over from a previous revision of ADMX and had to be removed via PowerShell. Technet procedure documented here. Runs daily and will sync the TemplateCatalog directoy specified.